The image in the centre is the Endeavour. Flag: British Red Ensign or “Red Duster” is a flag that originated in the early 1600s as an ensign flown by the Royal Navy. It is currently used as the civil ensign of the United Kingdom. 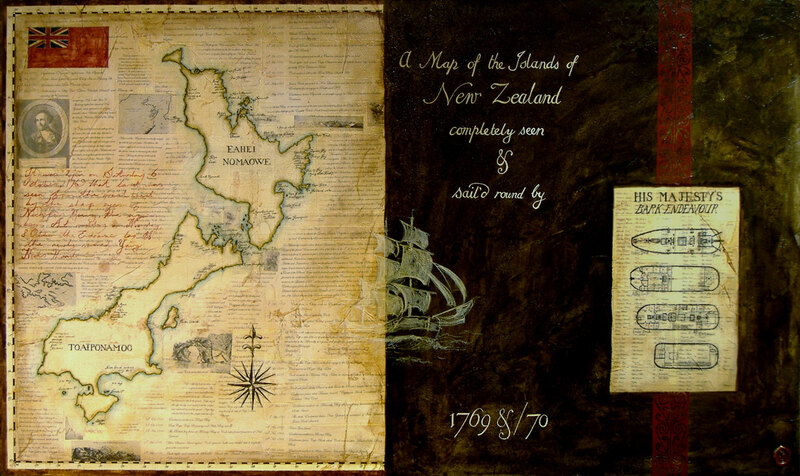 Script behind the floor plan is the full list of men aboard the Endeavour on her first voyage to New Zealand. Note: There are also parts of Kupe’s story, the first Polynesian Explorer to find and navigate the coast of New Zealand. Red Kowhaiwhai design: ‘Ngaru’ From Ngati Kahungunu represents the cutting of the waves as the waka moved through the water.